We're always interested in finding new and interesting Sauvignon Blanc wines. The appellation of Quincy (it's pronounced Can-See, not Kwin-see) is not very well known to most wine drinkers. 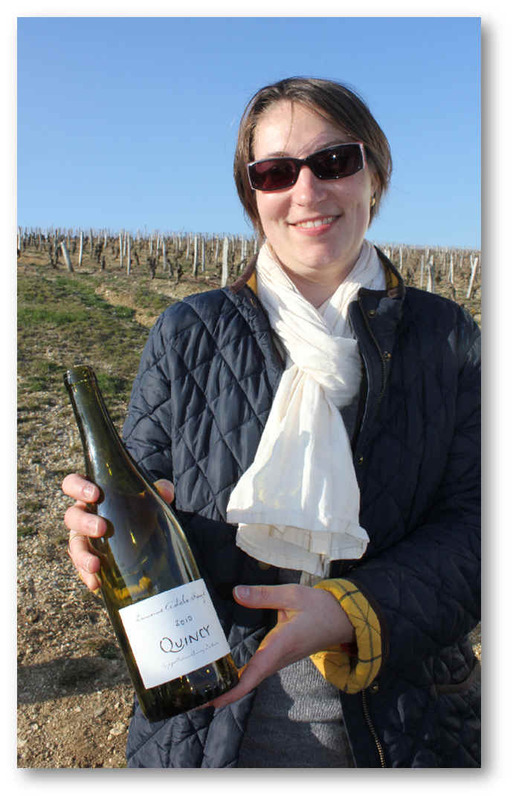 Even French people have little experience with Quincy wines, since those of nearby Sancerre tend to dominate wine lists in the Sauvignon "section." But Quincy has a very long history, being the first area to gain appellation status in the Centre-Loire way back in 1936. There are even references to Quincy and its wine as far back as the year 1120, well before the world had Robert Parker to tell it what wines to drink! Young Ad�le Rouz�'s father is one of the leading lights of the appellation. Ad�le now has about one hectare's worth of vines to work with when she's not doing her "day job" as a certified agricultural appraiser. The photo above shows Ad�le standing in front of her one 'tank' of wine and she's smiling because the notion of sending some bottles half-way around the world to be consumed by savvy, wine-drinking San Franciscans is almost a fantasy. But in reality, we now have our tenth vintage of her terrific Quincy. The appellation, by the way, is devoted solely to Sauvignon. The 2017 vintage is the current offering. We like its crisp character and unmistakable Sauvignon fragrances and flavors. It has a nicely intense Sauvignon aroma. The wine is at home with oysters, fresh crab, a salad with goat cheese, etc. When you make one hectare's worth of wine, you can make it the way you like, not having to worry about "marketing" and the like. As a result, this is not a wine appealing to those who prefer oak or residual sugar. Denis Jamain is "Monsieur Reuilly" to us, the owner and winemaker of the benchmark wines from this somewhat obscure Loire Valley appellation. Reuilly is due south of Orleans and south-west of Sancerre, Pouilly Fume and Menetou Salon. They tell us their harvest typically starts a week, or so, before wineries in Sancerre begin to pick their grapes. The soil is limestone and you really get a stony/minerally quality of the Sauvignon Blanc grown there. We find an almost salty note to the wine and it's stone, bone dry. The vineyard for this special wine comes from a two hectare site which is now farmed biodynamically. The vines are something like 23 years of age and the grapes are hand-harvested each vintage. If you're a fan of cured or smoked salmon, this is a terrific match. But fresh crab pairs well, as do prawns, scallops and white fish. Another interesting wine made by Jamain is Pinot Gris. He gives the wine a bit of skin contact and produces a light pink wine that we refer to as "good orange wine." In an era when some producers make orange-colored wines which are oxidized or worse, this is fresh, nicely fruity and rather dry without being too austere. We have not yet tasted the 2017, so it is not presently in stock. The Fiou family ran this estate for a number of generations and we are not sure if they are still on the property, as it seems the wine from these vineyards is being vinified by the famous winery of Henri Bourgeois, a leading Loire Valley producer and ambassador. The soils in the Saint Satur region, just a few kilometers northeast of downtown Sancerre, are quite flinty (silex) and produce a distinctive Sauvignon Blanc. This sort of terroir is a bit rare within the Sancerre appellation, but it's more commonly found across the river where they make Pouilly-Fum�. The 2017 is exceptional, having been vinified in stainless steel and matured for a few months on the spent yeast. It's crisp, bone dry, light, yet flavorful. The aromas are nicely intense, too. This is a modest little estate owned by the Chauveau family. The property was first purchased in 1951 by a doctor named Chauveau. His son Gerard, who was an architect, took over the estate in 1968 and decided to take the plunge and plant a few grape vines. Today the estate comprises about 93 hectares, but only 27 are devoted to vineyards. They make a fair bit of wine, all of it made of Cabernet Franc. Some wine is sold in bulk and they bottle the equivalent of about 10,000 cases. This wine is not one intended for wine geeks or collectors. It's not a trophy wine and it's not going to knock your socks off. I doubt the Chauveau's intend to make such wines. Instead, this is the sort of classic, old-fashioned, old-school, typical bottle of Chinon that is served in French restaurants around the world. It's a wine which transports me back to Paris and it's nothing hugely compelling. It's merely well-made and typical. I find the Cabernet Franc aromas to be reminiscent of red fruits and there's a faint suggestion of a woodsy, smoky note without the wine being overtly oaky. It's medium bodied, not heavy, but not watery. We suggest serving this at cool cellar temperature and you can pair it with lighter fare: roasted chicken, roasted pork, mild beef or lamb...rabbit? It's a fairly versatile wine and it's affordably-priced since it doesn't get 95 point scores. It does get a thumbs up from us, however. 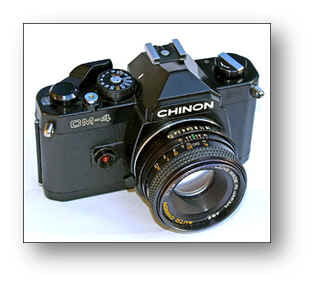 Chinon cameras do not run on Chinon wine. 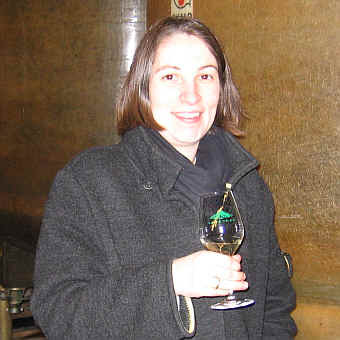 This 6 hectare Vouvray domaine started in about 1712 and was taken over in 1990 by Catherine Dhoye-Deruet. 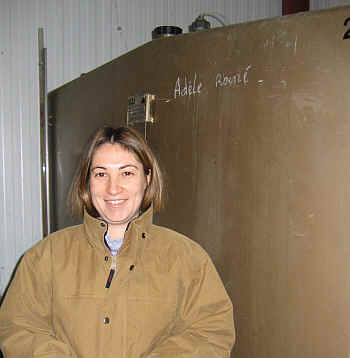 She produces about 25,000 bottles of wine annually, making dry, off-dry, sweet and sparkling wines. The vineyard property features chalky slopes in the Valle Coquette. Sparkling Vouvray is certainly known in the Loire Valley, but outside the region, few people have ever tasted such a wine. Catherine makes a non-vintaged bottling as well as a vintage-dated wine. 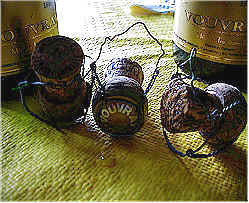 We find many wines of Vouvray to have a fragrance reminiscent of dried mushrooms. 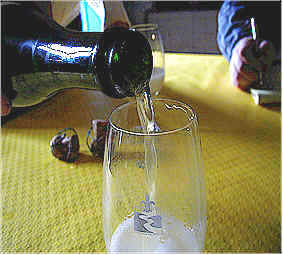 The sparkling wine here displays that aroma when first opened, for example. As the sparkling wine from this region is not thought to be the equal of Champagne, it remains a price-worthy alternative to its famous cousin. Twelve dollars and change will get you a bottle of Fontainerie's Brut Sparkler from the 1997 vintage. Samples for INAO, the French Bureaucracy. We tasted many wines on our visit. The "Rillettes" (in the little 'tub') from the artisan charcutier "Hardouin" are even prepared with Vouvray! Needless to say, the combination is quite good! 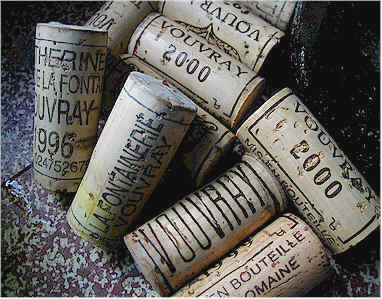 The 2007 Vouvray Sec is a nice example of Chenin Blanc from the Loire vinified in a dry style. Mildly fruity on the nose but with an "edge" to it. Called "La Maison d'Ana�s," this 14 hectare domaine is run by Sylvie Chaumeau and her cousin Jean-Jacques Auch�re. It's located in the prime terroir of Bu�, an ideal site for Sauvignon Blanc. It's all about the farming of the vineyards...nothing fancy here apart from stainless steel, temperature-controlled tanks to vinify the Sauvignon Blanc. We currently have the 2017, a bone dry, lip-smackingly crisp dry white with tones reminiscent of citrus in a minerally sort of way. Best chilled and paired with seafood. Once owned by a guy whose college training was as a language interpreter, this family used to own about a half the appellation of Quarts-de-Chaume at one time. We visited the property in March of 2002 and found an amazing cellar and vineyard. Organic farming. In fact, winemaker/wine grower Francis Poirel does biologique farming. Tiny yields, as he makes just 5,000 to 10,000 bottles annually from his 7.5 hectares. Amazing wines. This is one of those "serious" winemakers who understands how to coax the best from the vineyards and how to capture that special quality in the bottle. Poirel makes wonderfully expressive, soulful wines. 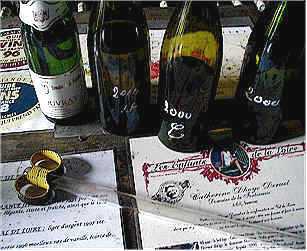 When we visited him we tasted a terrific dry white wine which he explained could "only" be designated as a Vin de Table. That's because the Appellation Contr�ll�e laws required the wine be fermented with a commercial yeast, not the wild yeast that's part of the grape skins! I can't quite recall precisely the rest of the silly, appallingly lame requirements, but the fruit was harvested too ripe and did not require Francis add sugar to the juice. This was another strike against the wine from the legal standpoint, but a positive factor from a wine quality perspective. 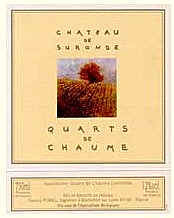 His 2002 Quarts-de-Chaume is a delicious Chenin Blanc. One of those wines which displays this magnificent and relatively unheralded grape. It's got lots of honeyed notes and yet retains a fine 'edge' of minerality and acidity. It was a magnificent combination!!! I've sensed from my few visits to the Sancerre area that this firm is highly respected by the smaller, independent growers in the area. While there are a number of fairly large firms doing business in this part of the Loire, none is as highly regarded as Bourgeois. And if you taste their wines, you'll understand they do strive for a quality product. Plus Monsieur Bourgeois travels the world, playing the role of an ambassador for Loire Valley wines. The last time we saw him here in California, his pockets were full of rocks! He wanted to show everyone the sort of terrain his wines come from! The various soils in the Sancerre region. Located in the famous village of Chavignol, they have a modest-sized facility towards the top of the hill. 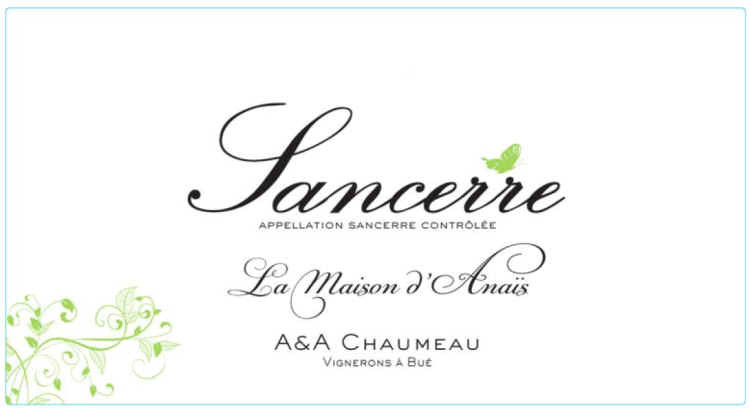 They bottle quite a range of wines, featuring a number of bottlings of Sancerre. We have their special bottling called d'Antan from the 2016 vintage. This comes from a Silex soil and the vineyard was first planted in the 1930s. The juice from the shy-bearing vineyards is fermented in seasoned oak cooperage and some vintages we sense a mild influence of the barrel. 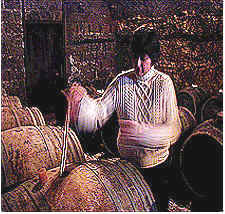 But they use 4, 5 and 6th use cooperage, not new wood which would be more apparent in the wine. Seafood is an especially good pairing for this. Dungeness Crab is ideal, but sea scallops, prawns or even a lemon-scented chicken work well with this. The Bourgeois folks suggest skewered sweetbreads with a truffle sauce or grilled Lobster. We also have found their entry-level Loire Valley Sauvignon to be quite good. It's from vineyards near Touraine and we've described it as being a "baby Sancerre." Maybe more like an "adolescent Sancerre" is a better description. It's mildly aromatic and fresh, with a touch of herbal Sauvignon on the nose. You'll find it to be dry and moderately crisp. And, best of all, it's well-priced. $12.99 (with case discounts!). This is a father and son enterprise, with son Christophe owning the Le Peu de la Moriette property and dad taking care of the Coteau de la Biche. Together there are about 27 hectares of vines. Typically the "Le Peu de la Moriette" label features wines of some level of residual sugar, while the Coteau de la Biche wines are in the dry to demi-sec range. 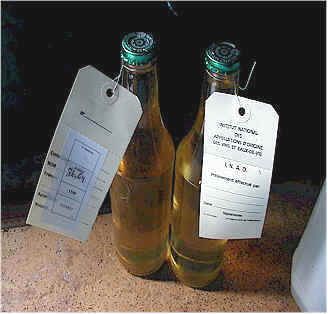 A number of producers of Chenin Blanc wines in the Loire take pride in the ability of their wines to cellar well. We visited a fellow who makes a small amount of Chenin for his own amusement and he showed us a bottle of a fifty year old wine which tasted far younger than it was. The Pichot's make a range of wines, but it's their "Moelleux" wine we've had in the shop the past few years. A relatively unknown wine, we were distressed to see a favorable review of this wine in The Wine Spectator. Never mind that few wine drinkers are interested in sweet Chenin Blanc, but those fixated on numerical scores stampede when some journal raves about a wine. It's some sort of religious thing, apparently. The 2003 is quite good. Still a bit young, but very nice. The acidity balances the sweetness. The fragrance is rather typical of many Vouvray wines and it's not a bright, fruity character but has a note which reminds me of many of the underground chalk cellars in the region. If you don't mind this "earthy" tone to the wine, you might enjoy trying a bottle. The 2015 is much like its predecessors...there's ample acidity to balance the sweetness, so the wine is quite good as both an aperitif and a 'table wine.' It's delicious now and should remain in fine shape for two or three years. Bright melon and a tangy, citrusy tone are the themes of this Vouvray. Good wine and good value. 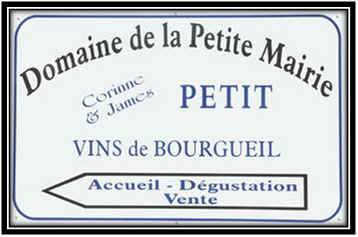 This little domaine is run by the Petit family. James Petit has vineyard holdings in several sites within the Bourgueil appellation and his uncle, Jean Gambier, was the head of the local grape growers' group. We favor their Les Galluches bottling of Cabernet Franc...the wine is a blend of a few different sites which have sandy soils and produce nicely aromatic wine. 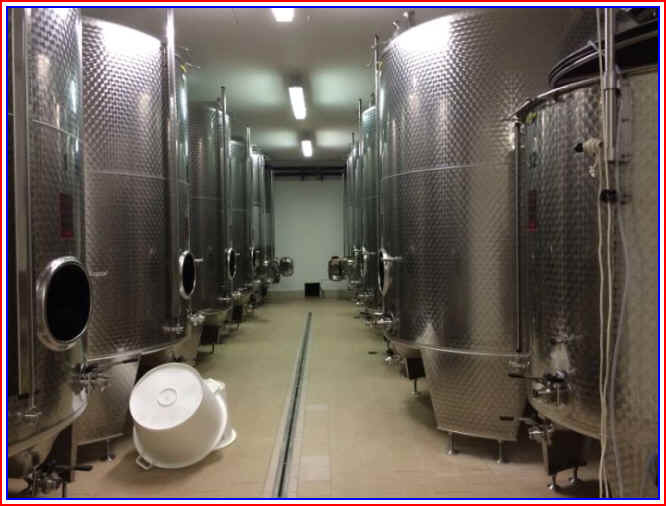 It is matured briefly in large wood tanks and then goes into cement vats until bottling. This is a medium-bodied Cabernet Franc, pretty much what you expect of Loire Valley red wine (not a blockbuster, buster). The fragrances are mildly herbal, with some cassis-like notes. We enjoy serving this at cool cellar temperature and it pairs well with chicken, pork and mildly-seasoned red meats. 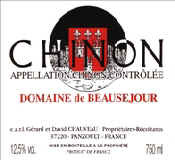 Wilfrid Rousse has built up a nice little domaine in Chinon, having started in 1987 with a mere one hectare parcel. Today he cultivates 19.5 hectares of vineyards and the domaine is certified as being famed biodynamically. Nineteen of those hectares are devoted to Cabernet Franc, but Rousse also farms a half hectare plot of Chenin Blanc. 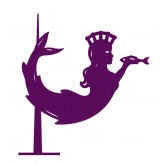 The symbol of the domaine is a weathervane featuring a mermaid holding a fish. A nearby chateau was once owned by a prominent admiral and governor and the weathervane of this mermaid adorned the house. He was said to have hosted all sorts of prominent dignitaries, including King Charles VII. The domaine is a partnership between Wilfrid Rousse and his wife Annie. He's up to his elbows in grapevines and in the cellar and she handles administrative and marketing issues. We tasted a couple of good wines from this property. The 2016 Les Galuches Chinon is a nice example of Cabernet Franc. It's a medium bodied red wine, bigger than a Beaujolais or Pinot Noir, but a bit lighter than a Cabernet or Merlot. It's not intended to be a big bruiser, but instead a more gentle sort of red wine. It's dry and there's a faintly smoky tone in the background with nice red fruit up front. 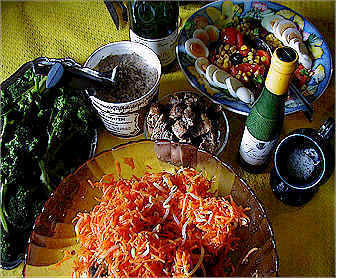 Serving it with roasted chicken, a savory pork roast, sausages, mild lamb or beef dishes, etc. Cool cellar temp will show it off nicely.